Welcome to the morning post!! :D If you haven't yet checked out the The Overnighter, I encourage you to do so. BB woke up the HG's at 8am BBT this morning, that's pretty early considering that they don't have anything going on today except for the Nominations Ceremony. After the HOH comp yesterday, he had to pick Have Nots for the week, but he didn't have to get his hands dirty for that because Helen/Elissa/Aaryn/GM all volunteered to be Have Nots for the week. *Aaryn has been complaining about her shoulders hurting. *Aaryn mentioned how Howard hated being called "Howie", which is what Candice always used to call him. *Helen did her morning run as usual. *Elissa thinks that there should be less Have Nots now that there's less HG's left. *Elissa said it was weird how Judd was mad at her/Helen when he got evicted, thinking they had a hand in it. She hopes he "sees the light" later on. Helen tells McCrae that it's good that they got Judd out because he would've had to decide between Judd/Amanda at some point down the road. McCrae agrees. McCrae: "I was telling Aaryn, I'm bummed out but like..I knew it had to be done. I knew, like..it was gonna happen a while ago. I knew this was happening." Helen: "Yea. I almost thought about keeping him when he was pleading (to stay)." McCrae: "Aghh, that was the worst!" Helen: "He was like 'Please Elissa, please Helen, I won't go against you guys!'" McCrae: "I'm not resentful at all." Helen: "He was really good at this game." McCrae said that this was the hardest eviction for him yet. Andy just told Spencer he's gonna call people up to the HOH room for pre-nominations conversations. McCrae tackles Amanda and hugs her. Amanda: "I'm not mad, baby. I wanna win one on my own, not have (a comp) thrown to me." 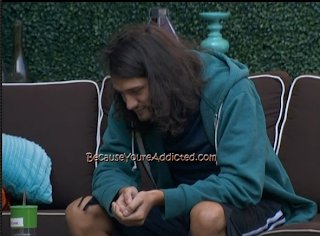 McCrae is looking for his cigarettes and is getting annoyed that he can't find them. They're discussing who to put up, who to target, and backup plans in case any of them fall through. Andy: "If Spencer wins Veto, GM goes home." Amanda: "I want Jessie to go home more than everything." Andy is worried that if he puts GM up, and stays, then she'll gun after him. Andy: "If Jessie wins veto, GM goes home, right?" They agree that Spencer winning veto would be "worst case scenario" for them. Jessie is still this weeks target. Elissa then Spencer joins the A/Am/Mc. Amanda goes inside a few minutes later to take a shower. **This is a long convo & worth the watch on Flashback on the live feeds. Basically, Helen wants Andy to make a power move. Andy doesn't. Helen is scared they're running out of time to get Amanda/McCrae out, Andy doesn't think so & says that they (Mc/Am) are coming after them right now, so now is not the time to strike. Helen: "I don't wanna be blindsided by (McCranda) when we have the opportunity to get them out now." Andy: "If I get get out Jessie or GM this week, then I will have zero people after me next week." Helen is still pushing for Andy to make a bigger move than getting out Jessie or GM. Andy said that Helen has to trust him that he's making a good move this week by not going after Amanda/McCrae & that Am/Mc would get out others in the house before them. Helen said she'll trust him. Andy hopes that he doesn't have to put up GM, and that he can just get Jessie out this week. Andy: "You know I'm gonna do what's best for the both of us." Helen: "Okay, I trust you. But if I win HOH, don't talk me out of putting (Am/Mc) up." Talk is about Judd's eviction last night. Helen: "He wanted McCrae for himself...the only people he didn't want out, was Andy & McCrae. Him/Andy/McCrae/Spencer could've come together & took the rest of us out." Amanda: "All we have to do is, us 5 stick together and we'll have the numbers." Amanda: "I don't want (McCrae & I) to go up together.."
Helen said she pulled Aaryn aside and told her that they had to get rid of Judd and that she promised her safety for 2 weeks (on behalf of Helen/Elissa/McCrae/Amanda) if she did it. Helen: "Sorry I didn't tell you before hand, but I had to get her to do it." Elissa is there with Helen/Amanda. They're all talking. Elissa asked Amanda if she wants Spencer out. Amanda says yes, but not this week. She wants Jessie gone this week because she thinks she'd break up herself/McCrae. Helen is now praising Amanda on her game play & for staying in the game after being on the block for 2 weeks from the MVP. Andy joins. Aaryn does as well. They're talking about the eviction last night. does anyone remember when there used to be suspense and anticipation over who would be nominated? even more apprehension if the pov was used and a replacement nom was needed? there was scheming, lying, backstabbing, betrayal of alliances…all missing this season. I always hear people here say how they think some of the HGs are terrible people and then wish for more backstabbing and lying, I just find that odd. I was so upset hearing GM comment about Candice's adoption last night. How can someone be so cruel and heartless and all the other house guests still treat them with respect? She is a vile person. it would have been more predictable if the moving company was still there. I would really HATE to see gm or aaryn end up with any $$ - but we are at the point in the game where they start thinking about who they want to be sitting next to at the end. I wonder if there was a method to Amanda's madness of acting like such a big baby last night? Perhaps to draw attention to what a huge loser she is that can't win a single comp to subtlely move the target on the power couple off her and more towards McCrae? Whether it was or not it seems to have worked. If amanda and helen was so worried about the guys forming an alliance why not get rid of spencer and judd. But I guess with candice winning all those comps she was a bigger threat. "I always hear people here say how they think some of the HGs are terrible people and then wish for more backstabbing and lying, I just find that odd." i've always separated moves made during gameplay (lying, betrayal, deception), and making bigoted comments to other house guests during normal conversations. Andy made the comment last night that if you were to describe Candice's game it was sleeping all day, then yelling at somebody. Candice is obviously a princess, with a very high opinion of herself: "I'm a very smart person", "I'm a very good person", "I'm a very strong woman",etc, Ok, if you say so. She tried to get in shots at GM on her way out the door, like she said she would, so GM responded in kind. Women fight so dirty. I think people want to hear more game talk but less personal attacks. They're completely different things. Like the conversation with Helen and Andy is a gopd example. Helen knows they need to split McCranda up and that they need to do it soon! Yay, because she's absolutely right and this is the kind of conversation we want. Bad example would be if Helen came in saying Amanda is a big whiney bi**h who needs to have her big tatas shoved out the door. Myself, I'm to the point where I'd be tempted to say the second but it's so catty it's begging for an argument. I would never have thought of that Brian! Good observation.